Dynamiki's range of shot and sand blasting cabinets are suitable for a wide range of production environments and abrasive media. Suitable for a wide range of media. Abrasives (those that will cut and erode the substrate): Aluminium oxides, Garnet, Soda and calcium silicate etc. Non abrasive (surface conditioning, impact or brightening/polishing): Glass bead, amino plastics, acrylic, crushed walnut shell, soft thermoplastics like nylon and polyamides. 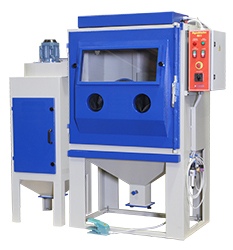 Dynamiki is the leading manufacturer of sand and shot blasting machinery in South East Europe. 30 years experience in the heavy industry, aviation and maritime industries has led them to design and manufacture a wide range of robust and cost effective machinery. Riley Surface World has picked a range of versitile sand blasting cabinets to serve the UK and European market. Why Buy a Blast Cabinet from RSW? The M11 suction feed cabinet is a general purpose heavy duty workshop machine suitable for a wide range of blasting applications. £ Login or Register for price. The M12 suction feed cabinet is a general purpose heavy duty workshop machine suitable for a wide range of blasting applications. 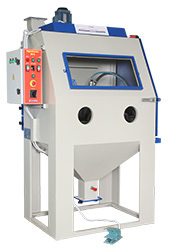 Designed for a smaller floor space with rear mounted dust collector.